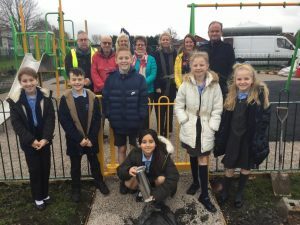 Pupils at Kew Woods primary school in Southport have planted a time capsule to help mark the planned opening of a new look play area they helped design. The time capsule was planted by pupils on the school council to mark the construction of Ovington Drive play area in Kew – right outside the school gates. Earlier this year, pupils worked closely with Sefton Council’s Green Sefton team to come up with a number of designs and suggestions for a revamped Ovington Drive play area. Their ideas were presented to the surrounding community and have now been realised with the new play area set to open shortly. It will consist of a newly designed gated area with swings, slides and other play equipment aimed at younger children, costing more than £43,000 to build. Money came from a number of sources including the school PTA, Sefton Council and Kew ward Section 106 funds. The metal time capsule, which includes items of school clothing and the school logo, a letter from the school council about what they love about the year 2018, and photographs of pupils along with details about their aspirations for the future, is set to be opened in 100 years-time. Cllr Ian Moncur, Sefton Council’s Cabinet Member for Health and Wellbeing, said: “We were delighted with the response from children at Kew Woods who came up with a wealth of fun, interesting and quirky ideas for the new look Ovington Drive play area. “Those ideas have now been realised with the planned opening of a fun and vibrant play area that is inclusive and welcoming for all which I’m sure will be well used. Christina Jackson, headteacher at Kew Woods primary school, added: “We have been fully behind this project and it was a great idea to get pupils thinking on what to put in the time capsule to mark the opening of the new play area.